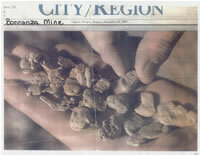 Article written about the Bonnanza Mine on November 28, 1988 and published in a Eugene, Oregon newspaper. A complete copy of this article is available on request. Tom Bonn declared in the interview that target gold recovery should be no less than $15/yard. This is what most of the ground looks like that will be mined. It is important to note the lack of large trees in this picture is because occupants of house nearby had logged them sometime in the past. This is a good picture, however, to show the quality of the ground to be mined due to the lack of trees. At least 90% of the property is heavily wooded unlike what is shown in this picture. This picture is from the same area as shown in the picture before. Please note the boulder extrusions that are common in this ground. 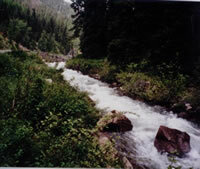 Note the beauty of Pine Creek that runs the length of the property (approximately three miles). It is also a very good fishing creek. The road just to the left of the creek is used for mining purposes only and the state highway is farther to right and goes through the property at different places. Pine Creek again. Note the forest and quality of the trees. More property ready to be mined. Poor picture quality but a good view of the open Bonnanza Mine pit. Approximately 60’ deep and 200’ wide. Pit is within 25’ feet of Pine Creek just to the right of the picture. This photo was taken in 1991. Note the 50ton truck leaving where it had just dumped its load. The dozer is now pushing the gravel to a place where an excavator will feed the recovery plant. 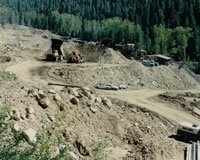 There is also two other loaders not shown in this picture to move the big boulders and the tailings. Bonnanza open pit with excavator loading an off road big truck. Notice large boulders on the left hand side of picture. These boulders were separated one by one and moved to this location because they were too big to go through the recovery plant. 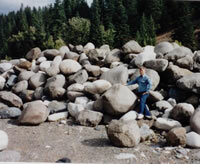 The left part of the picture shows storing boulders to keep them out of the way. The right side shows a truck that has just dumped what is called overburden because it did not have at least $15/yard gold. The dozer is preparing to push this overburden back in the pit. Notice the large trees to the right of the property. The pit always has two excavators, two trucks, and a dozer. 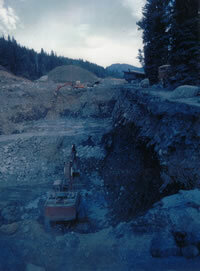 The trucks and the excavators can be seen in this photo. The dumping of overburden that did not run at least $15/yard. Recovery plant with more than $15/yard ground being dumped for processing. 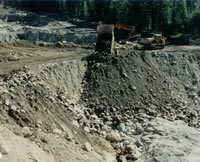 Loader and dozer used to help process ore and dump tailings. Also, note excavator loading the recovery plant. Pine Creek boulders too big for the recovery system. Another picture of those large boulders.